Healing must come from within. No one and nothing else can do it for you. We facilitate improvement by providing support for your bodys own innate self-healing capacity and by eliminating interference with its inherent regenerative processes. Your symptoms are an unpleasant consequence of one or more underlying health problems. If you were to suppress them without addressing their cause, your problems would likely remain or degenerate further. By treating their cause, we not only eliminate your symptoms and your discomfort but you enjoy better long-term success by resolving your underlying problems as well. You are composed of mutually dependent interactive systems. Whatever dysfunction may occur follows a pattern peculiarly yours. To address it, we employ a customized treatment strategy uniquely designed to strengthen each of your systems as needed. Our scope embraces your body, your emotions, and your mind. Health means more than the simple absence of disease. It is a continuum upon which your status incrementally improves or deteriorates every moment of every day. At the top end of this continuum is optimal health, at the bottom end death. 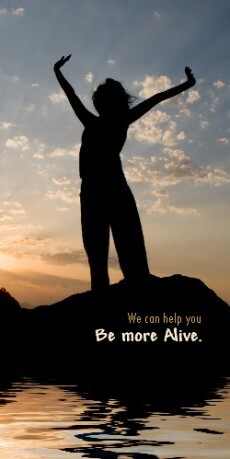 We help you raise your health status as close to the top as your interests and capacities allow. Our therapies are extremely safe because they work with your body not against it. They are natural, noninvasive, nontoxic, gentle, and pure. We never use drugs, procedures, or low-grade products that interfere with healthy function. The risk of unwanted side effects is negligible. Your daily behaviors have the greatest impact on your health. You choose them. If you choose behaviors that support your health, your life force will be vital and strong. If not, your condition will inevitably deteriorate. You are in control. We offer important tools and understanding to help you do the best job possible.